Be the first to share your favorite memory, photo or story of Bartie. This memorial page is dedicated for family, friends and future generations to celebrate the life of their loved one. 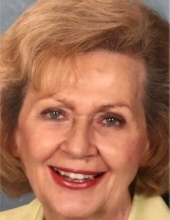 Bartie Prewitt Bullock departed this life on Sunday, March 31, 2019 at Baptist Health Corbin. She was 81 years and 7 days old. She was born on March 24, 1938 in Whitley County, to the late Authur Prewitt and Junice Angel Prewitt. She was a member of Central Baptist Church. She is survived by her husband, Roy Bullock of Corbin; one daughter, Suzanne Bullock Ray (Ryan) of Lexington; two granddaughters Ramsey Klaire Ray and Karson Ryan Ray of Lexington; two sisters, Reba Brown of Hartford, and Pauline Adkins of Corbin; two brothers Troy Prewitt (Donna) Corbin and Otto Prewitt (Bonnie) Hamilton Ohio; a a host of close nieces and nephews: Kathy Smith, Phyllis Monhollen, Eddie Adkins, Sharon White, Travis Monhollen, Elizabeth Lambdin, Zachary Prewitt, JT Smith, Emma Smith and many of other relatives and friends to mourn her passing. Visitation will be from 12:00 P.M. until the funeral hour on Saturday, April 6, 2019, at Central Baptist Church in Corbin, Kentucky. The Funeral Service will be at 2:00 P.M. Saturday, April 6, 2019, at Central Baptist Church with the Rev. Chad Fugitt , Rev. Eddie Adkins and Rev. James Vandy officiating. She will be laid to rest in the Worley Cemetery. Travis Monhollen, Tommy Monhollen, John Thomas Smith, Zachary Prewitt, Tom Kidd, Brandon Lambdin and Danny Smith will serve as pallbearers. To send flowers or a remembrance gift to the family of Bartie Prewitt Bullock, please visit our Tribute Store. "Email Address" would like to share the life celebration of Bartie Prewitt Bullock. Click on the "link" to go to share a favorite memory or leave a condolence message for the family.